Agile techniques have demonstrated immense potential for developing more effective, higher-quality software. However,scaling these techniques to the enterprise presents many challenges. The solution is to integrate the principles and practices of Lean Software Development with Agile's ideology and methods. By doing so, software organizations leverage Lean's powerful capabilities for "optimizing the whole" and managing complex enterprise projects. 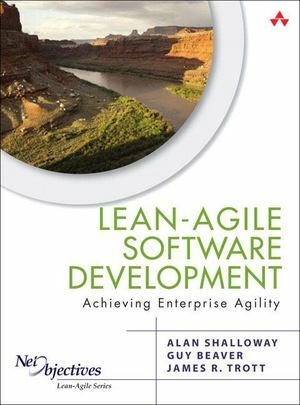 A combined "Lean-Agile" approach can dramatically improve both developer productivity and the software's business value.In this book, three expert Lean software consultants draw from their unparalleled experience to gather all the insights, knowledge, and new skills you need to succeed with Lean-Agile development. Lean-Agile Software Development shows how to extend Scrum processes with an Enterprise view based on Lean principles. The authors present crucial technical insight into emergent design, and demonstrate how to apply it to make iterative development more effective. They also identify several common development "anti-patterns" that can work against your goals, and they offer actionable, proven alternatives. Lean-Agile Software Development shows how to Transition to Lean Software Development quickly and successfully Manage the initiation of product enhancements Help project managers work together to manage product portfolios more effectively Manage dependencies across the software development organization and with its partners and colleagues Integrate development and QA roles to improve quality and eliminate waste Determine best practices for different software development teams The book's companion Web site, www.netobjectives.com/lasd, provides updates, links to related materials, and support for discussions of the book's content.